The Spirit is designed to deliver a beautifully open sound with sparkling harmonics. This highly accurate micro-phone gives a stunningly natural and transparent recording, capturing all the detail in the high range but without adding the harshness that some condenser microphones seem to. 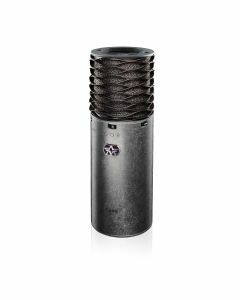 The Aston Spirit is an incredibly precise microphone catching all the intricacies in the high range whilst it avoids adding the harshness that some condenser microphones tend toward and gives a strikingly organic and clear recording. Making use of a 1” gold evaporated capsule, this high performance, switchable pattern microphone is built to deliver a gorgeously open sound with shimmering harmonics. Omni, Cardioid or Figure-of-Eight polar patterns can be chosen by a switch on the mic body. Excelling on acoustic guitar and vocals the Aston Spirit is also tactile enough to be used with most instruments. Only the optimal components like WIMA capacitors, the same parts used in boutique mics costing far more than the Spirit, comprise the high-end transformer balanced circuitry that’s combined with a high performance capsule. The Aston Spirit utilises a signature wave-form mesh head. As well as supplying an unparalleled level of defence for the heart of the microphone, the capsule, the unique design also looks exceptionally beautiful. Subject to a hard impact, the head of the mic will distort before returning to its ordinary locus, without succumbing damage, thanks to its shock resilient wave-form design. Undesirable artefacts are also removed from your recordings thanks to integrated off-axis rejection. An exclusive mesh-knit pop filter comes fitted as standard; machined into the wave-form head, as with all Aston condenser microphones. Sound is able to move while virtually eliminating unwelcome plosives at source because of its arbitrary weave. The Aston Spirit is perfect in critically sensitive electronic applications as it also repels various wavelengths of electromagnetic radiation. Rust after extended use is also not a problem because this wholly encapsulating, single piece mesh cage is formed in stainless steel and can be dismantled and washed. Custom moulded end caps with assimilated XLR and stand adaptor create yet another unique design element of the Aston Spirit. Not one other microphone possesses this attribute. You can mount the mic straight to a stand via this built in and transposable thread adapter – the internal shock absorption system is that good. This design feature also means that the Aston Spirit is exceptionally stress-free to repair and maintain.